Men þa leofostan, eow eallum is cuð þæt ðes gearlica ymryne us gebrincð efne nu þa clænan tid lenctenlices fæstenes, on ðam we sceolon ure gymeleaste and forgægednysse urum gastlicum scrifte geandettan, and us mid fæstene, and wæccum, and gebedum, and ælmesdædum fram synnum aðwean, þæt we bealdlice, mid gastlicere blisse, ða Easterlican mærsunge Cristes æristes wurðian moton, and þæs halgan husles þigene mid geleafan underfon, us to synne forgifennysse, and to gescyldnysse deofellicera costnunga. Dearest people, you all know that the cycle of the year now brings to us the pure season of the Lenten fast, during which we should confess our negligence and transgressions to our spiritual confessor, and by fasting and vigils and prayers and almsgiving cleanse ourselves from sin, so that we may confidently, with spiritual joy, celebrate the Easter festival of Christ's resurrection, and receive the holy sacrament with faith, for the forgiveness of our sins and protection from the temptations of the devil. Be ðisum cwæð Drihten on his godspelle, 'Ne behyde ge eowerne goldhord on eorðan þær ðær omm and moððan hit awestað, and ðeofas adelfað and forstelað; ac hordiað eowerne goldhord on heofenum, þær ne cymð to ne om ne moððe, ne þeofas ne delfað ne ne ætbredað. Soðlice ðær ðær þin goldhord is, þær bið þin heorte.' Hu mage we urne goldhord on heofonum behydan buton ðurh ælmessan? Swa hwæt swa we be anfealdan Godes þearfum for his lufan syllað, he hit us forgylt be hundfealdum on ðam toweardan life. Of this, the Lord said in his gospel, 'Do not hide your goldhoard on earth, where rust and moths destroy it, and thieves dig it up and steal it; but hoard up your goldhoard in heaven, where no rust or moths can touch it, and no thieves can dig it up or take it away. Truly where your goldhoard is, there is your heart.' How may we hide our goldhoard in heaven except through alms? Whatever one thing we give to God's needy for the sake of his love, he will repay us for it a hundredfold in the life to come. eldum swa unnyt swa hit æror wæs. as useless to men as it was before. a thousand winters there in the earth's embrace. 'Eaten through' by worms and moths, perhaps. I can't resist pointing out that elsewhere in Old English poetry a moth can be referred to as a devouring wyrm, which is also the word used for the guardian of Beowulf's hoard. Perhaps a moth is just a very tiny dragon. Thieves, treasure, goldhoards, and wyrm-like agents of destruction - we've come back to the Arkenstone and The Hobbit all over again. I can't quite make up my mind how much of this resonant mixture of associations is already inherent in the Gospel passage, and how much has been added by the Old English translations - or whether the language is meant to evoke so vividly the familiar images of treasure in Anglo-Saxon poetry. 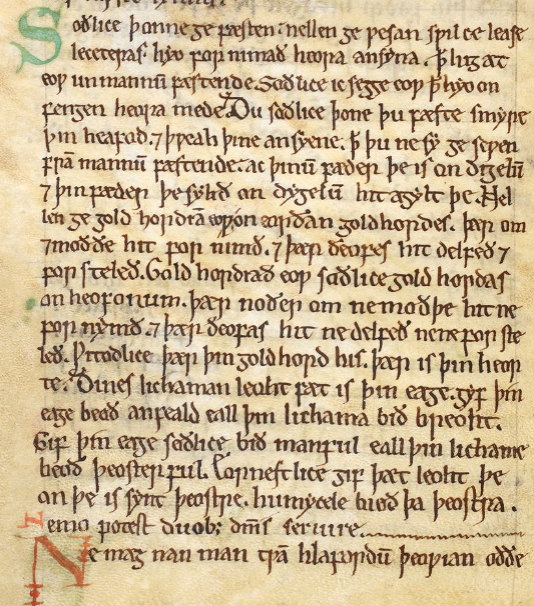 But the final point to make is that Christ's last statement, 'where your goldhoard is, there is your heart' is particularly appropriate because in Old English poetry the heart itself is often called a 'hoard', the place where the treasures of the spirit are kept. It is the breosthord, feorhhord, or sawelhord, the storehouse of thoughts or the life or the soul. And there's one other relevant -hord compound: wordhord, the store of words treasured up within the mind of a poet or a preacher. As Ælfric told us at Epiphany (quoting Solomon, sort of), "A goldhoard much to be desired lies in the mouth of a wise man'; words are treasures, too, as his own words help to demonstrate. 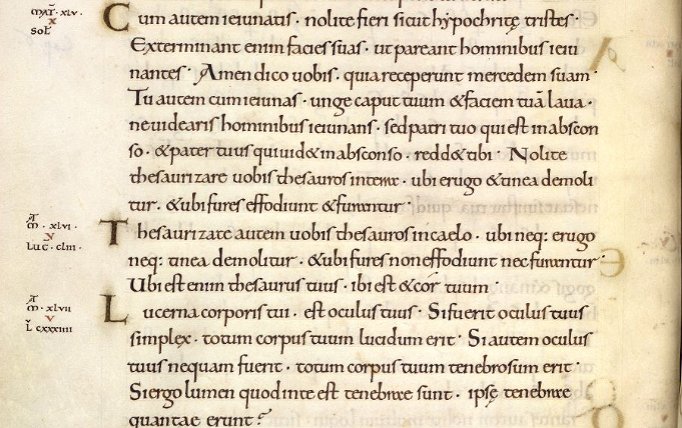 Some extracts from Ælfric's sermon for Quinquagesima, the Sunday next before Lent. He begins, as is his usual practice, by translating into English the Gospel reading for the day; in this case it's Luke 18:31-43, in which Christ speaks of his death to come and heals a blind man. Her is geræd on þissum godspelle, þe we nu gehyrdon of ðæs diacones muðe, þæt se Hælend gename onsundron his twelf leorningcnihtas, and cwæð to him, Efne we sceolon faran to ðære byrig Hierusalem, and þonne beoð gefyllede ealle ða ðing þe wæron be me awritene þurh witegan. Ic sceal beon belæwed ðeodum, and hi doð me to bysmore, and beswingað, and syððan ofsleað, and ic arise of deaðe on þam ðriddan dæge. Þa nyston his leorningcnihtas nan andgit þyssera worda. Ða gelamp hit þæt hi genealæhton anre byrig þe is gehaten Hiericho, and ða sæt þær sum blind man be ðam wege; and þaþa he gehyrde þæs folces fær mid þam Hælende, ða acsode he hwa þær ferde. Hi cwædon him to, þæt þæt wære ðæs Hælendes fær. Þa begann he to hrymenne, and cwæð, Hælend, Dauides Bearn, gemiltsa min. Ða men þe beforan þam Hælende ferdon ciddon ongean ðone blindan, þæt he suwian sceolde. He clypode þa miccle swiðor, Hælend, Dauides Bearn, gemiltsa min. Þa stod se Hælend, and het lædan þone blindan to him. Þaða he genealæhte, þa acsode se Hælend hine, Hwæt wylt ðu þæt ic þe do? He cwæð, Drihten, þæt ic mage geseon. 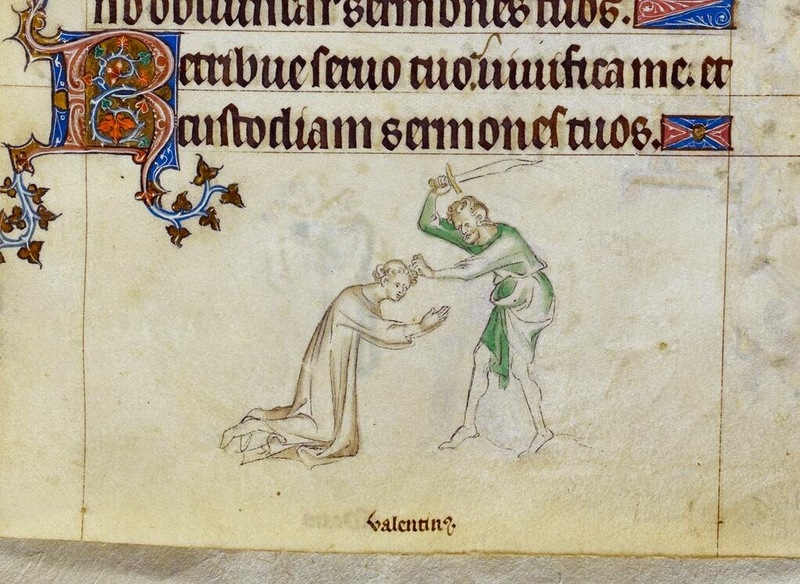 And se Hælend him cwæð to, Loca nu: þin geleafa hæfð ðe gehæled. And he ðærrihte geseah, and fyligde þam Hælende, and hine mærsode. Þa eal þæt folc, þe þæt wundor geseh, herede God mid micelre onbryrdnysse. Ðyses godspelles anginn hrepode ures Hælendes þrowunge, þeah-hwæðere ne ðrowade he na on ðysne timan; ac he wolde feorran and lange ær cyðan his ðrowunge his leorningcnihtum, þæt hi ne sceoldon beon to swiðe afyrhte þurh ða þrowunge, þonne se tima come þæt he ðrowian wolde. Heora mod wearð afyrht þurh Cristes segene, ac he hi eft gehyrte mid þam worde þe he cwæð, "Ic arise of deaðe on þam ðriddan dæge." Þa wolde he heora geleafan gestrangian and getrymman mid wundrum. And hi ða comon to ðære stowe þær se blinda man sæt be ðam wege, and Crist hine gehælde ætforan gesihðe ealles þæs werodes, to ði þæt he wolde mid þam wundre hi to geleafan gebringan. Þeah-hwæðere þa wundra þe Crist worhte, oðer ðing hi æteowdon þurh mihte, and oðre ðing hi getacnodon þurh geryno. He worhte þa wundra soðlice þurh godcunde mihte, and mid þam wundrum þæs folces geleafan getrymde; ac hwæðre þær wæs oðer ðing digle on ðam wundrum, æfter gastlicum andgite. Þes an blinda man getacnode eall mancynn, þe wearð ablend þurh Adames gylt, and asceofen of myrhðe neoxenawanges, and gebroht to ðissum life þe is wiðmeten cwearterne. Nu sind we ute belocene fram ðam heofenlican leohte, and we ne magon on ðissum life þæs ecan leohtes brucan; ne we his na mare ne cunnon buton swa micel swa we ðurh Cristes lare on bocum rædað. Þeos woruld, þeah ðe heo myrige hwiltidum geðuht sy, nis heo hwæðere ðe gelicere ðære ecan worulde, þe is sum cweartern leohtum dæge. Eal mancyn wæs, swa we ær cwædon, ablend mid geleaflæste and gedwylde; ac þurh Cristes tocyme we wurdon abrodene of urum gedwyldum, and onlihte þurh geleafan. Nu hæbbe we þæt leoht on urum mode, þæt is Cristes geleafa; and we habbað þone hiht þæs ecan lifes myrhðe, þeah ðe we gyt lichamlice on urum cwearterne wunian. Ne bæd se blinda naðor ne goldes, ne seolfres, ne nane woruldlice ðing, ac bæd his gesihðe. For nahte he tealde ænig ðing to biddenne buton gesihðe; forðan ðeah se blinda sum ðing hæbbe, he ne mæg butan leohte geseon þæt he hæfð. Uton forði geefenlæcan þisum men, þe wæs gehæled fram Criste, ægðer ge on lichaman ge on sawle: ne bidde we na lease welan, ne gewitenlice wurðmyntas; ac uton biddan leoht æt urum Drihtne: na þæt leoht ðe bið geendod, þe bið mid þære nihte todræfed, þæt ðe is gemæne us and nytenum; ac uton biddan þæs leohtes þe we magon mid englum anum geseon, þæt ðe næfre ne bið geendod. To ðam leohte soðlice ure geleafa us sceal gebringan, swa swa Crist cwæð to ðam blindan menn, "Loca nu, þin geleafa ðe gehælde." 'Here it is read in the gospel, which we heard just now from the deacon's mouth, that the Saviour took his twelve disciples apart and said to them, "Behold, we shall go to the city of Jerusalem, and then all the things which were written about me by the prophets shall be fulfilled. I shall be betrayed to the Gentiles, and they shall mock me, and scourge me, and afterwards kill me, and I shall rise from death on the third day." His disciples did not understand the meaning of these words. Then it happened that they came near to a city which is called Jericho, and a certain blind man sat there beside the road; and when he heard the passing of the people with the Saviour, he asked who went past there. They said to him that the Saviour was passing. Then he began to cry out, and said, "Saviour, Son of David, have mercy on me!" The men who were going in front of the Saviour chided the blind man to make him keep quiet. He cried much louder then, "Saviour, Son of David, have mercy on me!" Then the Saviour stopped, and told them to lead the blind man to him. When he came near, the Saviour asked him, "What do you want me to do for you?" He said, "Lord, that I may see." And the Saviour said to him, "Look now: your faith has healed you." And he immediately saw, and followed the Saviour, and glorified him. Then all the people who saw that miracle glorified God with great fervour. The beginning of this gospel touched on our Saviour's passion, though he did not suffer at this time; but he wanted to make known his suffering to his disciples, from afar and long before, so that they would not be too afraid at his suffering, when the time came that he chose to suffer. Their minds were afraid at Christ's saying, but he encouraged them again by the words he spoke: "I will rise from death on the third day." Then he wanted to strengthen and confirm their faith with miracles. And they came then to the place where the blind man sat beside the road, and Christ healed him in the sight of all the multitude, so that by that miracle he might bring them to faith. But the miracles which Christ worked manifested one thing by power, and betokened another thing by mystery. He worked those miracles, truly, through divine power, and with those miracles confirmed the people's faith; but yet there was another thing hidden within those miracles, in a spiritual sense. This one blind man betokened all mankind, who were blinded through Adam's sin, and thrust from the joy of Paradise and brought to this life, which is likened to a prison. Now we are shut out from the heavenly light, and we may not, in this life, enjoy the eternal light; nor do we know any more of it than we read in books, through Christ's teaching. This world, though it may at times seem pleasant, is really no more like the eternal world than a prison is like the bright day. All mankind, as we said before, were blinded with lack of faith and error, but through Christ's coming we were snatched up out of our errors and enlightened by faith. Now we have the light in our minds, that is Christ's faith; and we have a hope of the joy of everlasting life, though we still dwell bodily in our prison. Nis ðeos woruld na ure eðel, ac is ure wræcsið; forði ne sceole we na besettan urne hiht on þissum swicelum life, ac sceolon efstan mid godum geearnungum to urum eðele, þær we to gesceapene wæron, þæt is to heofenan rice. Nu genealæcð clæne tid and halig, on þære we sceolon ure gimeleaste gebetan: cume forði gehwa cristenra manna to his scrifte, and his diglan gyltas geandette, and be his lareowes tæcunge gebete; and tihte ælc oðerne to gode mid godre gebysnunge, þæt eal folc cweðe be us, swa swa be ðam blindan gecweden wæs, ðaða his eagan wæron onlihte; þæt is, Eall folc þe þæt wundor geseah, herede God, seðe leofað and rixað a butan ende. Amen. It was the custom described in this last paragraph, of preparing for Lent by going to confession (scrift), which later led to these three days before Ash Wednesday being known as Shrovetide. 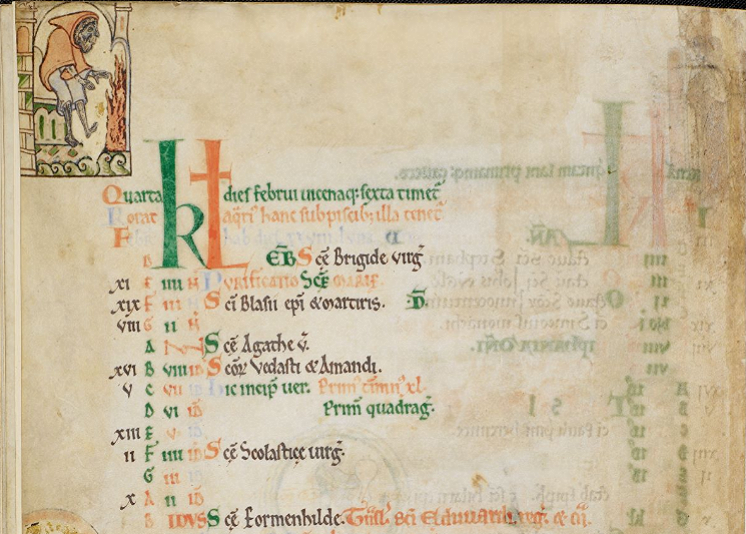 On the one hand, this three-day period was a time for the kind of devout preparations Ælfric describes here, in order to start off Lent in a good spiritual state. At the same time, at least by the later Middle Ages, it was also a period of last-chance merrymaking and revelry before the soberness of Lent: a carnival of Shrovetide games, riotous plays, and eating up the rich food which would be off the menu until Easter. Hence, of course, pancakes. 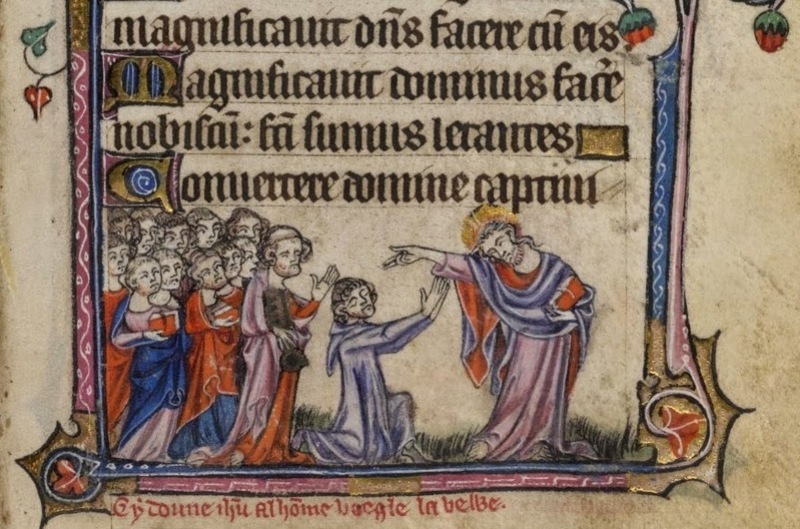 For Ælfric's homily for Ash Wednesday, see this post. On this blog, I aim to be useful. 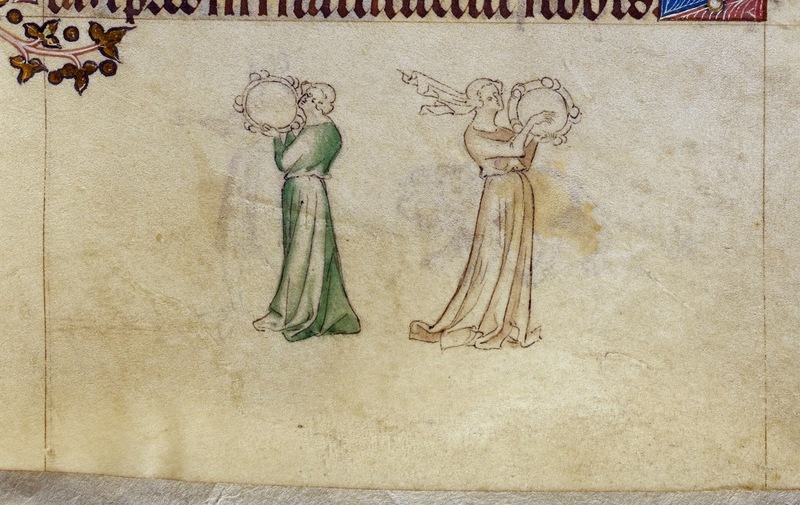 So if you are currently in need of some resources for a medieval Valentine's Day - compliments, endearments, love poems and all - you may be pleased to hear that I collected some together, for your benefit and use, in this post. However, if you happen to think romantic love is all sentimental nonsense, I can recommend this spoof love poem; and if you want something a little more philosophical, there's 'All other love is like the moon'. And today I offer for your enjoyment a poem which is mostly about the delights of not being in love. A pitous thyng to hire. And sure fro yere to yere. And laugh at there maner. Y bought hit al to dere. I thencke to hold me here. This song with vs in fere. A piteous thing to hear. And secure from year to year. And laugh at their manner. I bought it all too dear. I intend to stay here. This song with us together. The last verse is particularly puzzling to me; crue must mean something like 'gang of people', but it's an odd word, and that sense isn't recorded in the MED. The earliest non-military sense in the OED is from 1570. So is a military sense intended? It must mean literally 'I wish for all the crue who suffer (or permit?) pain to have the same fate as you, that they might sing with a merry heart this song with us together'. But who is 'you', and what was his (or her) fate? All very mysterious. But if you don't worry too much about the exact situation, this is an attractive little song; there's a palpable sense of liberty and play about it - the speaker free to wander wherever she likes, to 'eat, drink and be merry', and to laugh at the silly ways of lovers. 'Since I am thus escaped, I intend to stay here!' So you can take this an anti-Valentine, if you like. the Ruler's child, she brought to the temple. carried out of the camps. 'Five nights after Candlemas' might look at first glance like an arbitrary date, but these calculations were worked out with great precision by experts in the science of computus: today falls halfway between the winter solstice and the spring equinox, and as spring lasts from now until May, the equinox will fall in the middle of the season. lencten hrimigost, he byð lengest ceald. spring is frostiest, it is the longest cold. Spring may not be the coldest season, but it's cold for the longest time (or maybe it just feels like it, because we're impatient for the weather to improve). Ælfric, in his De Temporibus Anni, a vernacular summary of learned scientific opinion on time, the seasons, and the natural world, explains (perhaps anticipating similar questions from his audience) that in spring 'the lengthening day is cold because the earth is permeated with the winter chill, and it takes a long time before it is warmed again'. Early spring is also wet and muddy, as you can guess from the fact that one possible interpretation of the Old English name for February, Solmonaþ, is the unappealing-sounding, yet undeniably accurate, 'mud-month'. But there's much more to spring than coldness and mud, and in this post I want to gather together a few assorted extracts from Old English poems which, when read together, have some interesting things to say about the power of spring. There are others I could have chosen; this is just an exercise in juxtaposition, really. deop deada wæg, dyrne bið lengest. the deep way of the dead, will be the longest hidden. Ælc sæ, þeah heo deop sy, hæfð grund on ðære eorðan, 7 seo eorðe aberð ealle sæ, 7 ðone micclan garsecg, 7 ealle wylspringas 7 ean ðurh hire yrnað. Swa swa æddran licgað on þæs mannes lichaman, swa licgað ða wæteræddran geond þas eorðan. he set himself through his true power. and þone toweorpeð wide swa æscean. and to wætere weorðeð sniome. sæla ond mæla; þæt is soð Metod. over times and seasons. He is the true God. heaþoswate, 'war-sweat', is a kenning for blood; the sword melts like an icicle in its heat, blood and water mingled together. Again we see the link between the thaw and 'he who has power over times and seasons' - þæt is soð Metod. Metod is a common epithet for God in Old English poetry, but it's not a straightforward one: it seems to mean something like 'the one who metes out', the force which controls not just frosts and times and seasons but the shape and duration of human lives. You can translate it as 'the Measurer', the one who controls fate and time and all the mysterious chaos of the never-resting waters. and swiftly turn to water. se blæwð westan, 7 ðurh his blæd acuciað ealle eorðlice blæda 7 blowað, 7 se wind towyrpð 7 ðawað ælcne winter. The speaker leaves the comforts of life on land to journey across the whale's way (hwælweg), over the cold waters to find 'warmer joys' in heaven. He becomes a pilgrim, of a sort; to compare a later but probably more familiar example, you might remember that it's when springtime signs of life appear in the natural world - singing birds, the sap rising, and Zephyrus 'with his swete breeth' - that, Chaucer tells us, "than longen folk to goon on pilgrimages". Through Lent and spring we come to Easter, of course. Spring is a yearly liberation from the confines of winter, but it can also be read as a confirmation, through the signs in nature, of the greater liberation brought about by Christ's death and resurrection. 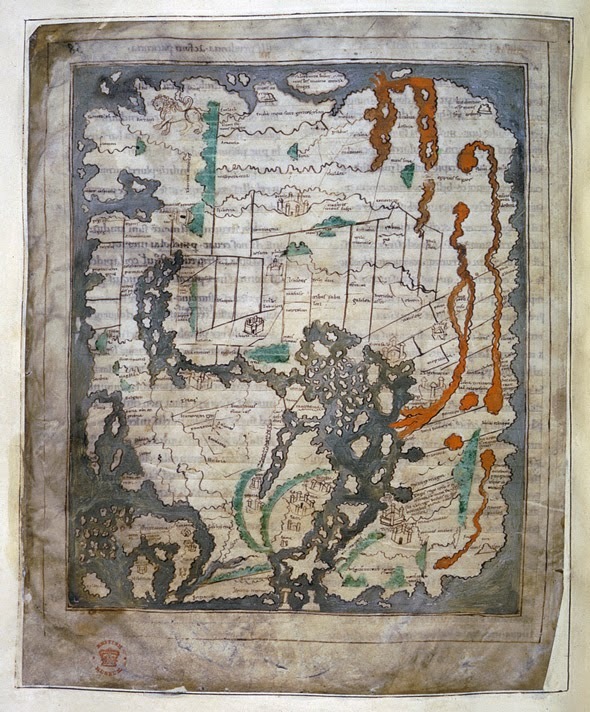 At the moment of Beowulf's victory, blood and water gush forth, as if from Christ's side upon the cross; in The Dream of the Rood, both Christ and the tree bleed blood and water, beswyled mid swates gange, and 'all creation weeps' thawing tears. In Norse mythology, just such a liberating thaw almost weeps Baldr out of the underworld, 'as all things weep when they come from frost into warmth' - a spring-like resurrection vividly re-imagined by C. S. Lewis in his description of Aslan's return to Narnia. 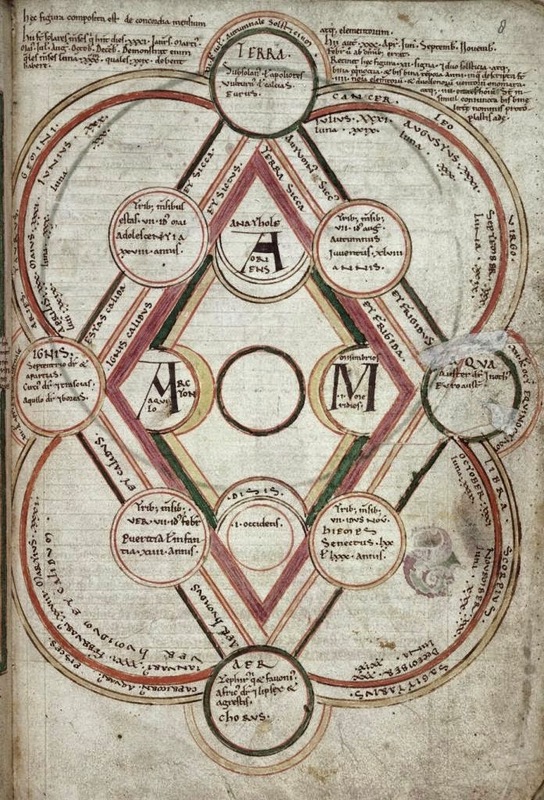 The diagram above is from BL Harley 3667, a manuscript made at Peterborough Abbey in the twelfth century. 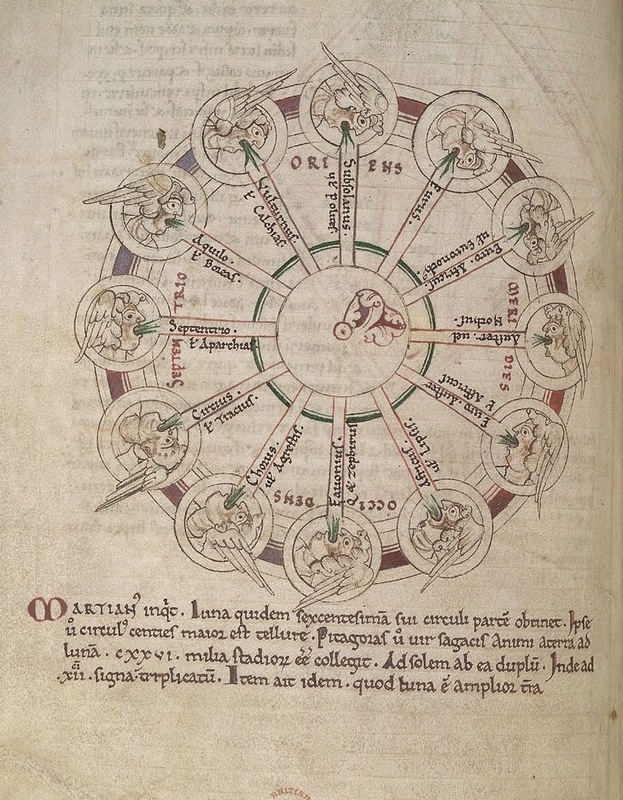 It was designed by the monk Byrhtferth of Ramsey, and shows the correspondences between the four seasons of the year, the months, elements, winds, astrological signs, and more, as well as the seasons of human life, from childhood to old age. It's a work of art as well as a clever act of synthesis; the course of the year is a complex interweaving of patterns, and the intricacy of the arrangement has a beauty of its own. To begin to appreciate this view of the world is to see all the universe as interconnected, with pattern and order running through it like those 'veins' of rivers which thread across the earth. In this view all the seasons of human existence have their correspondences in the heavens and in the year, and our lives, which can seem so random and meaningless, are part of a great pattern as ancient and as huge as the universe. Those of you who follow me on Twitter may have heard that this blog recently won an award (!) for Digital History from the magazine History Today, and they've just published online a very generous article about it. This feels like far more than my little blog deserves, but I'm immensely grateful nonetheless. As a consequence, I know there are quite a few new readers around here at the moment, and I wanted to write a post firstly to say hello to them (hi! ), and secondly to talk a little about what I consider to be the aim of this blog. In case you've wandered over here from History Today and are wondering what on earth is the rationale behind a blog like this, I'll attempt to explain. But I'll try and keep it short, because I'm sure you're all capable of reading an About page (which essentially says all this already). I wrote recently about why blogging as an early career academic has been such an enriching experience for me, so I won't repeat what I said there, either. I think the first thing I want to say is that although this is a blog about medieval literature it has always been, first by chance but now by choice, personal in nature and scope: by that I mean I write only about things which I like and which I want to write about. This is a deliberate decision, partly because to attempt to be comprehensive or even representative would be impossible (and far beyond my capabilities), but most importantly because I want to help my readers to enjoy the literature I study. I'm not a historian; I study and teach medieval English literature. Although a large part of what I study is made up of historical texts - chronicles, saints' lives, and so on - my primary interest is in them as literature; I'm interested in how medieval people perceived and wrote about the past, whether that perception was accurate or not. 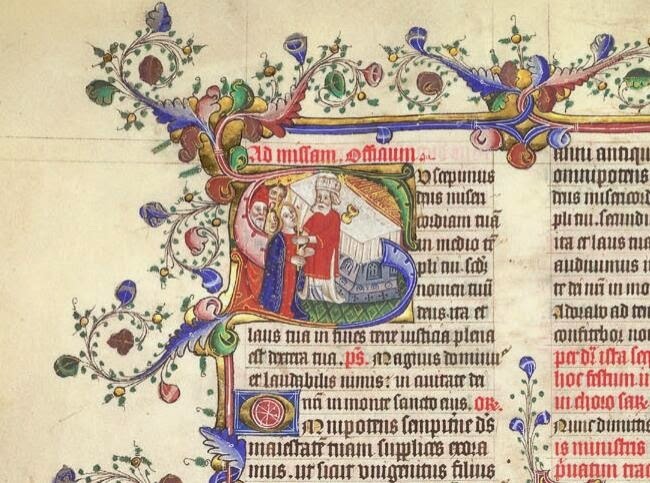 In this blog I approach the medieval world through its texts, and the guiding principle here is that medieval literature is just as sophisticated, profound, funny, subtle, imaginative, and diverse as the literature of any other period. You might not think that needs to be said - but it does, and often, in a world where 'medieval' is a popular synonym for 'cruel, uncivilized, or primitive'. I couldn't begin to illustrate the range and diversity of medieval English literature in a blog; no one could. But what I hope to do here is to illustrate, post by post, some of the ways in which I personally find medieval literature to be thought-provoking, or pleasurable, or moving. There are many misconceptions about the medieval period, and especially about its literature, starting with the fact that many people are completely unaware how much of it there is. This was the first revelation to me when I began to study medieval English literature as an undergraduate. Like many British people of my age, I never studied any pre-modern literature at school, and although I had heard of Chaucer (growing up near Canterbury, it was impossible not to), I knew almost nothing about the medieval period - its history or its literature. This is not unusual, in my experience. The way my history education worked (and I imagine this is still common in the UK) was that we started with the Romans in primary school, and then progressed forward in time as we got older; we learned about the Vikings when we were ten, the Anglo-Saxons at eleven, the Black Death at twelve, and that was it. The last four years of my history schooling were devoted to the twentieth century - with the result that I could tell you an awful lot about the Russian Revolution, but I still struggle with Magna Carta. I'm not judging whether this was a good or bad thing (obviously it's not much help to me in my present career, but I understand why schools make these decisions), but it does mean that my understanding of medieval history, like that of many people I know, consisted for a long time mostly of what was taught to me at primary school - that is, what was thought appropriate for ten-year-olds. It was all very blood and guts and Horrible Histories, intended to 'make history fun' (yet somehow never quite doing so, for me). The medieval period was presented to me as - well, 'cruel, uncivilized, and primitive', because that's what children are generally supposed to find entertaining, and I grew up thinking it was simplistic because it had been explained to me in simple terms. That was stupidity on my part, but I don't think it's an uncommon error. If I hadn't been forced to study medieval literature as part of my undergraduate degree, I suspect I might have gone the rest of my life thinking - like many otherwise well-educated people I encounter - that the medieval period consisted of nothing more complex than what had been taught to me at ten years old. There certainly would have been little in popular culture to challenge what I had been told about the Middle Ages - that it was an unfortunate blip in history, 1000 years of benighted unreason between the clever Romans and the colourful Tudors. Fortunately, although I didn't particularly want to study medieval literature, I was made to. I came to it totally cold, in my first term at Oxford, and I fell in love with many different aspects of it, all at once; I just couldn't believe how much of it there was and how interesting it all was. The intricacies of Old English poetic language, which you could wrestle with all your life and never master; strange but mesmerising stories about saints and the heroes of romance; translations of familiar texts into unfamiliar language; riddles and wisdom-poetry which made the everyday extraordinary; Anglo-Saxon homilists carefully explaining, in a language I could learn to recognise as English, complex theological ideas; audacious Chaucer and the richness of Piers Plowman; the volumes and volumes of anonymous Middle English lyrics, all the voices of poets whose names we'll never know. So many writers, readers, poets, teachers, students, thinkers - not one of them 'cruel, uncivilized or primitive'. It was astonishing to me, and I've never quite got over that astonishment. That was the reason I started a blog when I was a graduate student, and it's the main reason I keep it going. 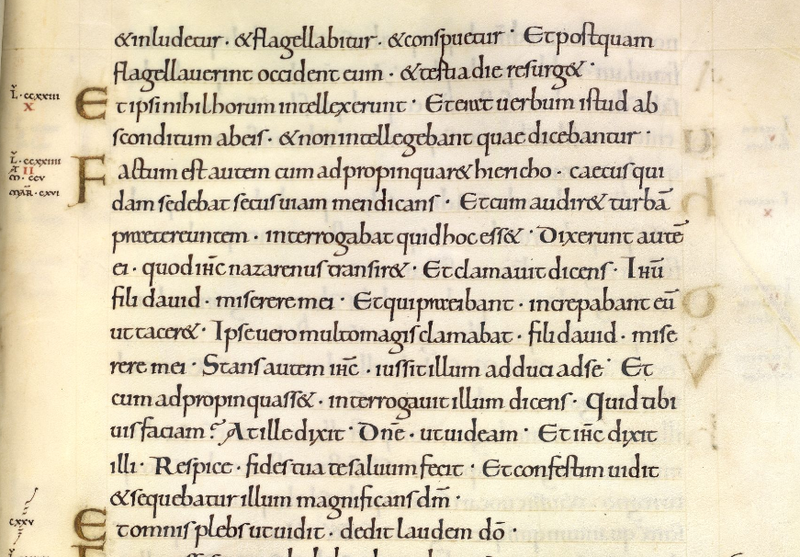 In a world where the general public know almost nothing about medieval literature (and yet think they know various untrue things, like 'it's all in Latin', 'it's all by men'), I think it's just worth saying, again and again: look how much there is, and look how interesting it is. It's not uncommon to hear people assert that 'the Middle Ages didn't have much literature, because most people were illiterate'. Or 'no one wrote poetry in English before Chaucer'. Or 'no one translated the Bible into English until the Reformation'. Or 'people didn't love literature' until 1750. A lot of quite educated people believe these things, and I don't blame them at all - I would have thought the same, if my education had stopped at eighteen. These assertions are wrong, but that doesn't stop them being repeated, endlessly, and it doesn't mean we should stop trying to illustrate the many ways in which they are incorrect and misleading. There's often a bit more than ignorance going on too, of course; in Britain there's a deep-seated cultural prejudice against medieval religion, in particular, which means that many people simply don't want to take it seriously. That was also part of how I was taught about the medieval period ('gullible pilgrims fleeced by greedy monks at Thomas Becket's shrine') and this is a prejudice inculcated in many British people at an early age; I'm still surprised how often people who are otherwise quite broad-minded (of my parents' generation and older) have a visceral, emotional, kneejerk reaction against pre-Reformation religion, which makes them unable to regard it with the critical detachment they might have towards any other religion or culture different from their own. They were taught that the medieval church was corrupt, superstitious, ignorant, and hateful towards the poor; to them it's all somehow very 'un-English', and just to talk about relic-cults, miracle-stories, nuns, and so on - even as a subject of academic study - is like being in thrall to dark forces. Whether this stems from old-fashioned Victorian anti-Catholicism or New Atheist scorn for religion, in effect it all ends up sounding the same (especially when it's coming from trolls on Twitter). I don't entirely know how to deal with it, since it's so alien to me. All I can say is that I take the medieval past seriously, and that to understand any historical period you need to try and accept it to some extent on its own terms, however unpleasant you might find them. The medieval church could be corrupt or cruel, of course - any human institution can be - but I find it bizarre how often people talk about all medieval religion as if it were one big cynical scam. 'Medieval religion' encompasses 1000 years of history, and beliefs which touch the deepest currents in human life - birth and death, marriage and vocation, sickness, fear, grief, joy, love. You don't have to think any of it was true to appreciate why people might have found it meaningful; if you can't credit some degree of sincerity to those 'greedy monks' - who, in the Anglo-Saxon period at least, wrote or preserved almost every single literary text we have - it will limit your ability to understand the literature. So yes, I write about saints and relics and miracles here and I take them seriously, if not always literally. If you approach the strangeness of it all with an open mind, it can help you think in new ways about the things we take for granted - whether that's our attitude to science, or our relationship to the natural world, or our expectations about what we can hope for from life, ourselves, and each other. On this blog I write about poems, carols, sermons, prayers, saints' lives, historical texts and more, in Old English and Middle English and sometimes in Old Norse and Latin too - for absolutely no reason except that I think it's incredibly interesting, and I want other people to find it interesting too. That may sound like a broad range of genres and languages, but it's actually very limited, a tiny sample, compared to how much falls under the umbrella of 'medieval literature'. Since I write about what I like most, certain things get massively over-represented here, and some things completely under-represented, out of proportion to their actual importance. There's a bias towards England, of course, and especially the south of England (sorry...). 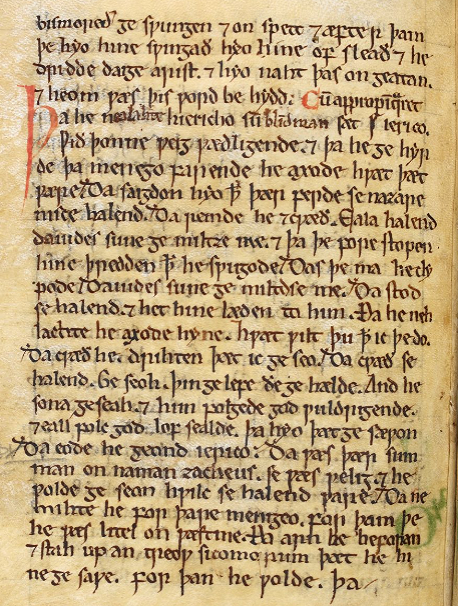 There's a lot of Ælfric on this blog, and not much Beowulf; lots of anonymous Middle English lyrics, but very little by Chaucer or the Gawain-poet or any of the major Middle English authors. That's mostly because there's much more available out there on the internet on those topics, by people more qualified than me. But I deliberately choose to focus here on texts which are less well-known, because my goal is just to think and talk, in public, about the richness of the literature I myself study and teach - which is, I should repeat, only a miniscule fraction of what exists. If you're new here, and you're prepared to tolerate that, you're very welcome. A few things to listen to on the evening of this feast-day. I promise this is my very last post about Candlemas. I am, as you may have gathered from my last few posts, particularly fond of this feast, for reasons which are personal and a little sentimental: they include, for instance, a love for Cnut's Candlemas song at Ely, the subject of a section of my doctoral thesis I was particularly proud of; a real fondness for the medieval texts I've posted and linked to over the past few days; and a sense that on this day one can get especially close to the world of Anglo-Saxon Christianity, of Ælfric and Æthelwold and Dunstan and the rest. But more than anything I associate this day with the Nunc Dimittis, a text which as a student in a college choir I sang many times, in many different forms, week after week, with people who are very dear to me - so it's dear to me too, for that reason. 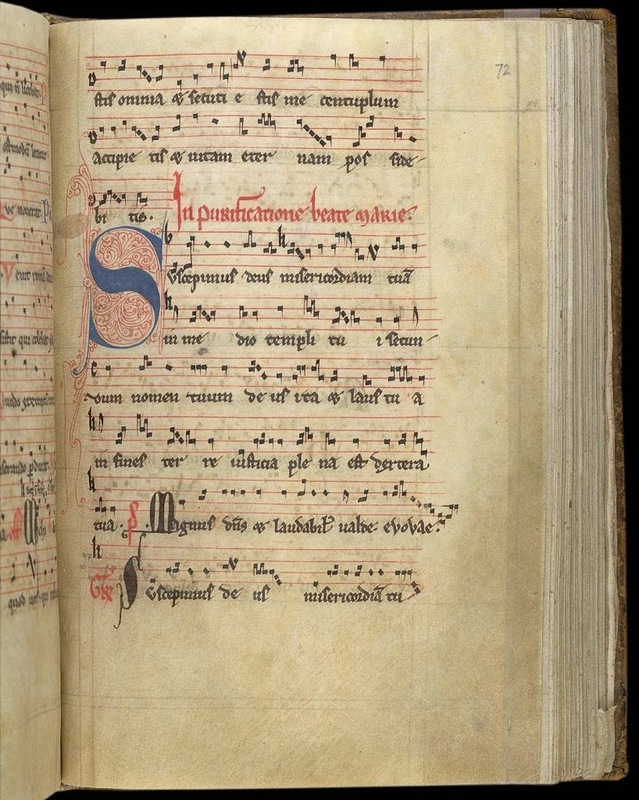 I also have a special liking for the Nunc Dimittis because I vividly remember the first time I encountered it. It was in my early teens, when I was taken for some reason to Evensong in a little church in the town where I grew up. Although a beautiful (and, I know now, an ancient) church, it's in a deprived area, rundown, with a small and aging congregation. When I went to Evensong there were perhaps four or five people in the congregation, with a few more in the dedicated but raggedy choir. The service, from the Book of Common Prayer, was mostly said or chanted by the congregation in unison. So there I was at thirteen, encountering Evensong for the first time: a near-empty church, the very plainest music, and an elderly church community of the kind which is always supposed to put young people off. But I loved it, odd child that I was - all because of the strangeness and beauty of the language. Although I had had quite an extensive religious education, and had been to a Catholic primary school, I don't think that until that point in my life I had ever heard a beautiful prayer; I'd certainly never encountered religious language that was challenging or difficult. At Evensong I was fascinated by the knotty language of the psalms and the collects, but it was one phrase in the Nunc Dimittis which struck me most of all: a light to lighten the Gentiles. It's such a simple, obvious rhetorical device, and I didn't know then that there's a name for it (polyptoton, in case you're wondering); I didn't know where the phrase came from, or what it meant, or even what Gentiles were (extensive religious education, remember!). I didn't know then what would matter to me now, that it's a poetic device which would work just as well in Old English as in the Tudor English of the Prayer Book - a phrase which an Anglo-Saxon writer could recognise, appreciate, even play with. None of that would have meant anything to me then. I just knew that it was beautiful. Up to that point, religion and beauty of language had seemed to me like quite distinct concepts; beauty was what I found and hungered for in poetry, but it had nothing to do with the simple, mostly banal language in which all religious ideas had been taught to me. I didn't know you could pray beautiful prayers, and I didn't know you could pray for abstract things like 'light'. It was a revelation to me that religious language could be interesting or beautiful, or that there was a place for beauty or complexity in religion at all. It was the first time I learned that prayer could be poetry, and poetry could be prayer. On the Purificacyon Day er ellys Candilmesse Day whan the sayd creatur beheld the pepil wyth her candelys in cherch, hir mende was raveschyd into beholdyng of owr Lady offeryng hyr blisful sone owr Savyowr to the preyst Simeon in the tempyl, as verily to hir gostly undirstondyng as yyf sche had be ther in hir bodily presens for to an offeryd wyth owr Ladys owyn persone. Than was sche so comfortyd be the contemplacyon in hir sowle that sche had in the beholdyng of owr Lord Jhesu Crist and of hys blissyd Modyr, of Simeon the preyste, of Joseph, and of other personys that ther weryn whan owr Lady was purifyid, and of the hevynly songys that hir thowt sche herd whan owr blisful Lord was offeryd up to Symeon that sche myth ful evyl beryn up hir owyn candel to the preyst, as other folke dedyn at the tyme of offeryng, but went waveryng on eche syde as it had ben a dronkyn woman, wepyng and sobbyng so sor that unethe sche myth stondyn on hir feet for the fervowr of lofe and devocyon that God putte in hir sowle thorw hy contemplacyon. And sumtyme sche myth not stondyn but fel downe amonge the pepil and cryid ful lowde, that many man on hir wonderyd and merveylyd what hir eyled, for the fervowr of the spiryt was so meche that the body fayld and myth not endur it. Sche had swech holy thowtys and meditacyons many tymes whan sche saw women ben purifyid of her childeryn. Sche thowt in hir sowle that sche saw owr Lady ben purifiid and had hy contemplacyon in the beheldyng of the women wheche comyn to offeryn wyth the women that weryn purifiid. Hir mende was al drawyn fro the erdly thowtys and erdly syghtys and sett al togedyr in gostly syghtys, whech wer so delectabyl and so devowt that sche myth not in the tyme of fervowr wythstondyn hir wepyng, hir sobbyng, ne hir crying, and therfor suffyrd sche ful mech wonderyng, many a jape and many a scorne. What's particularly striking to me about this passage is that for Margery Kempe, the mother of fourteen children, a ritual of purification after childbirth was an everyday part of female experience - not something she would only encounter at Candlemas, but the occasion for frequent meditation whenever she saw women being 'churched'. It was not an unfamiliar or alien practice - as it surely is for most congregations today - but something she had experienced herself, something she had in common with Mary and with many other women. 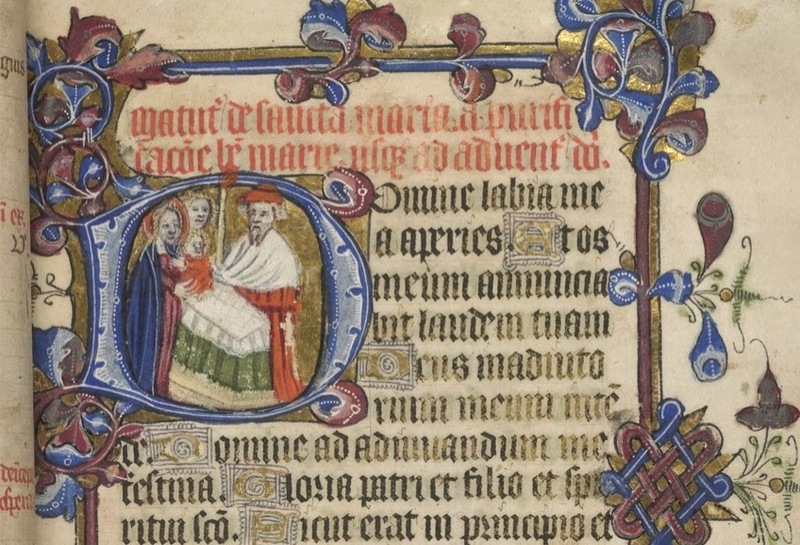 Margery Kempe was an extraordinary woman in many ways, but here (apart from the 'wavering like a drunken woman', perhaps) she was doing exactly what every ordinary member of the laity was supposed to do at Candlemas: transporting herself into the Biblical story, joining the procession into the temple in spirit and in body, bearing light in her hands. She was doing what St Dunstan's mother Cynethryth had done, and in doing so also received a revelation - though a private vision, not a public miracle. It's worth noting that a longer period of time separates Cynethryth and Margery Kempe than separates Kempe and the Candlemas poem I posted yesterday, which was written during the First World War. From Cynethryth to Margery, from Glastonbury to Lynn, and for many other women and men in many other places, these ceremonies were an important part of ordinary people's lives for so many centuries; it's so strange - not to use any stronger word - that they are no longer. In Roman Catholic churches on February 2, candles are blessed and distributed to the congregation, and the Nunc Dimittis is sung. A clean and holy light, to pierce the glooms of thought. Yet, in that distant day, the darkness held no fears. To the great night are given. That mocks our little light. Because the lights are few. "Mine eyes have seen, and I depart in peace."